Part of the Pro Serve range from Rubbermaid, the Pizza Delivery bag ( Rubbermaid alternative code FG9F3600 ) is designed especially for professional food delivery. Its RCP “Steam Release System” enhances thermal retention properties; steam will be released more effectively and moisture retention will be drastically reduced. 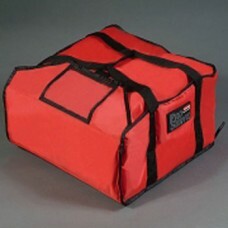 Lightweight and stylish, its dimensions are 45.7x43.8x19.6cm. Durable nylon construction designed for years of performance.